13 Night Cruise sailing from Dover roundtrip aboard Boudicca. On the east coast of Iceland, your ship will divert into Reyðarfjörður – the longest and widest of the beautiful Eastern Fjords – and stop at the enchanting fishing town Eskifjörður. Here you’ll be presented with the stunning sight of Mount Hólmatindur, regarded as one of the most impressive scenic delights in the region. 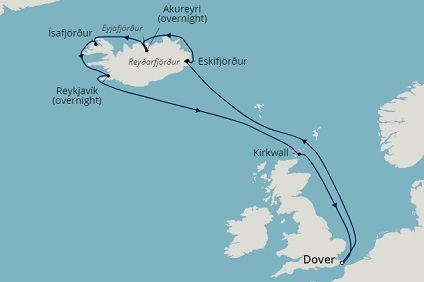 Continuing north, Boudicca will head for Iceland’s longest fjord, Eyjafjörður. Scenic cruising of this narrow, picturesque waterway en route to Akureyri will be an experience to remember; rugged cliffs, mountains and islands such as Hrisey – home to over 40 species of seabirds – come into view here. Once docked in Akureyri, an overnight stay will allow you time to go in search of natural treasures such as the glorious Godafoss ‘Waterfall of the Gods’ and Lake Mývatn; or even embark on once-in-a-lifetime whale watching tours for chances to see Humpback and Minke Whales, dolphins and porpoises in their unspoilt, natural habitat. Akureyri’s charming church, Art Museum and Botanical Gardens are worth discovering too. Within the scenic Westfjords, Ísafjörður – situated on the banks of one of Iceland’s deepest fjords – is a delight to explore. Here you can enjoy a relaxing day admiring the splendid natural harbour and uncovering the beautifully preserved timber houses and friendly cafés of the charming town centre. Alternatively, perhaps you’ll opt to marvel at magnificent untouched centre on an exhilarating fjord kayak tour; or take a boat trip to see the puffins of Vigur Island. Ísafjörður is also your gateway to the remote Hornstrandir Nature Reserve. Enjoying an overnight stay in Reykjavik is the perfect way to end your Icelandic adventure. The world-famous wonders of the Golden Circle – the gushing Geysir hot springs, the mighty Gullfoss waterfall, and the UNESCO-listed Thingvellir National Park – are within your reach here, though you could choose to visit the Blue Lagoon and bathe in its warm geothermal waters. Two days in capital affords time visit interesting museums, galleries and delightful cafés too. As you finally head for home, you’ll call at Kirkwall en route back to Dover, for a chance to delve into the rich history and rugged scenery of the Orkneys. Located in Northern Iceland, Akureyri is a beautiful town best known for its spectacular landscapes, lush vegetation and its diverse wildlife. The perfect destination for nature lovers, the waters surrounding the town are teaming with rare, native species such as humpback whales, minke whales, white-beaked dolphins and porpoises to go in search of. Exploring the town’s atmospheric paved streets and twisting lanes, reveals a number of highlights, including the ruins of the Earl and Bishop’s Palaces, dating from the mid-12th century and serving as a reminder of the Orkney's turbulent past. The palaces are considered by many to be the finest Renaissance buildings in Scotland. Also worth visiting is the recently restored St. Magnus Cathedral, founded in memory of Saint Magnus Erlendsson by Norseman Earl Rögnvald Kali.